Kloos Hauling and Demolition are leaders in commercial waste management and junk removal. 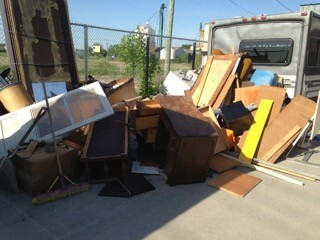 We take items that your regular garbage removal won’t take, and are likely too big and too much to dispose of yourself. We offer full-service junk removal for businesses, offices, and industrial sites including Commercial Waste, Construction Debris, Bin Rentals, Cleanup, and Demolition. We properly recycle and dispose of Computers, TVs, Printers, Monitors, and all other electronic equipment and appliances.